You can have your girls come dressed as their favorite super hero. Then when they arrive we made their very own super hero mask to wear during the day during the event. 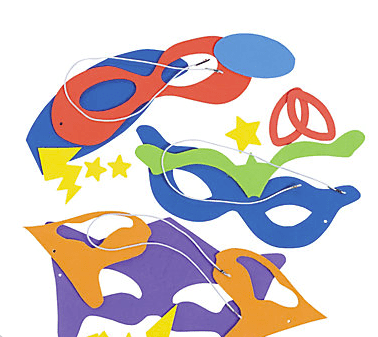 Superhero Masks Craft Kits – Makes 12. After everyone was dressed and ready to go we split the girls up into groups of 5 to 8 girls in the same age bracket. Each group was given a list of pictures to work as a group to take as many as they can in a set amount of time. After the girls completed taking the picture we ordered pizza and played a few group games with the girls while a few of the adults went to develop the pictures. When they returned girls put together poster boards with all the pictures and each group shared the pictures they had taken during the day. As a added bonus for our girls we also went around and took close up pictures of different areas in the park. Then gave to girls called it Super Sight bonus pictures since it was a Super hero theme it worked great. they had to find the picture location and take a picture as a group next to or on that location. You will have to create your own but as a example you can see how I created my form and one of the groups with picture next to location. If you love this idea check out the A – Z Photo Scavenger Hunt. Use the directions to run your very own Photo Scavenger hunt from beginning to end no planning necessary. Just follow the steps in the booklet and your work is done for you! Click here to get the booklet.